- "The possession and consumption of coca leaf in its natural state, for the practice of chewing, or for use as an infusion, will not be considered as drug possession or consumption." - one goal is to "Develop alternate sources of income for growers of coca"
U.K. APPG report - "Coca leaf: a political dilemma?" U.N. WHO (1995) - report stating use of coca leaves has no negative health effects suppressed at the request of the U.S.
- "Coca and Cocaine - effects on people and policy in Latin America"
Click here for Timetable of History of Coca. Roberto Laserna, economist at the Fundación Milenio in La Paz. In 2011, published a book, "The failure of prohibition". FM's reports regularly discuss coca. 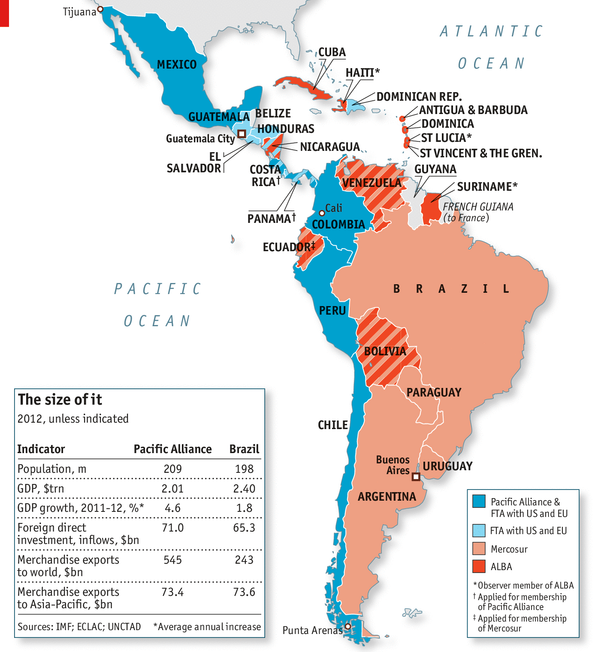 Click here for a map: Pacific Alliance, ALBA and Mercosur countries, initial markets for coca products.